Interest expense (IntExp) is an important part of a company's income statement (or 'profit and loss' or 'statement of financial performance'). (a) the bond's face value multiplied by its annual yield to maturity. (b) the bond's face value multiplied by its annual coupon rate. (c) the bond's market price at the start of the year multiplied by its annual yield to maturity. (d) the bond's market price at the start of the year multiplied by its annual coupon rate. (e) the future value of the actual cash payments of the bond over the year, grown to the end of the year, and grown by the bond's yield to maturity. A 10 year bond has a face value of $100, a yield of 6% pa and a fixed coupon rate of 8% pa, paid semi-annually. What is its price? Investors expect the Reserve Bank of Australia (RBA) to keep the policy rate steady at their next meeting. Then unexpectedly, the RBA announce that they will increase the policy rate by 25 basis points due to fears that the economy is growing too fast and that inflation will be above their target rate of 2 to 3 per cent. (a) Appreciate against the USD, so the 'European terms' quote of the AUD (AUD per USD) will increase. (b) Depreciate against the USD, so the 'European terms' quote of the AUD (AUD per USD) will decrease. (c) Appreciate against the USD, so the 'European terms' quote of the AUD (AUD per USD) will decrease. (d) Depreciate against the USD, so the 'European terms' quote of the AUD (AUD per USD) will increase. (e) Appreciate against the USD, so the 'American terms' quote of the AUD (USD per AUD) will decrease. A fairly priced stock has an expected return equal to the market's. Treasury bonds yield 5% pa and the market portfolio's expected return is 10% pa. What is the stock's beta? Payout policy is most closely related to which part of a business? (b) Liabilities and owner's equity. (c) Current assets and current liabilities. (d) Dividends and buy backs. (e) Net income, also known as earnings or net profit after tax. Below are some statements about loans and bonds. The first descriptive sentence is correct. But one of the second sentences about the loans' or bonds' prices is not correct. Which statement is NOT correct? Assume that interest rates are positive. Note that coupons or interest payments are the periodic payments made throughout a bond or loan's life. The face or par value of a bond or loan is the amount paid at the end when the debt matures. (a) A bullet loan has no interest payments but it does have a face value. Therefore it's a discount loan. (b) A fully amortising loan has interest payments but does not have a face value. Therefore it's a premium loan. (c) An interest only loan has interest payments and its price and face value are equal. Therefore it's a par loan. (d) A zero coupon bond has no coupon payments but it does have a face value. Therefore it's a premium bond. (e) A balloon loan has interest payments and its face value is more than its price. Therefore it's a discount loan. Which of the following statements about call options is NOT correct? (a) Buyers of call options are required to pay an initial margin at the start. (b) Call options are a zero-sum game in the sense that the winner gains at the expense of the loser. (c) Buyers of call options have to pay the option price at the start. (d) Buyers of call options do not care about the credit risk of the original call option seller since the contract is novated by the exchange. (e) Speculators who sell call options hope that the underlying asset price falls. Adam and Bella are the only people on a remote island. Their production possibility curves are shown in the graph. Which of the following statements is NOT correct? 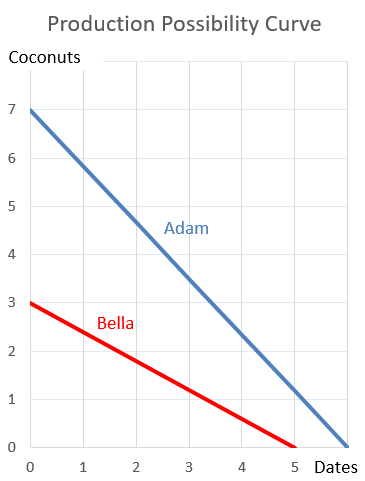 (a) The equation of Adam’s production possibilities line is coconuts = -7/6*dates + 7. (c) Adam could pick 2 dates and 4.667 coconuts in one hour. (d) Bella could pick 2 dates and 1.8 coconuts in one hour. Who was the first theorist to propose the idea of ‘expected utility’? (b) John Larry Kelly Jr. The arithmetic average continuously compounded or log gross discrete return (AALGDR) on the ASX200 accumulation index over the 24 years from 31 Dec 1992 to 31 Dec 2016 is 9.49% pa. The arithmetic standard deviation (SDLGDR) is 16.92 percentage points pa. Assume that the data are sample statistics, not population statistics. Assume that the log gross discrete returns are normally distributed. What is the standard error of your estimate of the sample ASX200 accumulation index arithmetic average log gross discrete return (AALGDR) over the 24 years from 1992 to 2016? (a) 43.9125 percentage points per annum. (b) 3.4538 percentage points per annum. (c) 1.9371 percentage points per annum. (d) 0.705 percentage points per annum. (e) 0.3954 percentage points per annum.